RUTLAND — As part of National Volunteer Week (April 12–18), the Rutland Area Farm and Food Link (RAFFL) and the Vermont Gleaning Collective invite community members to register as volunteer gleaners. Harvest fresh, unsold produce from farms – “gleanings” – and help make good use of crops that would otherwise go to waste. 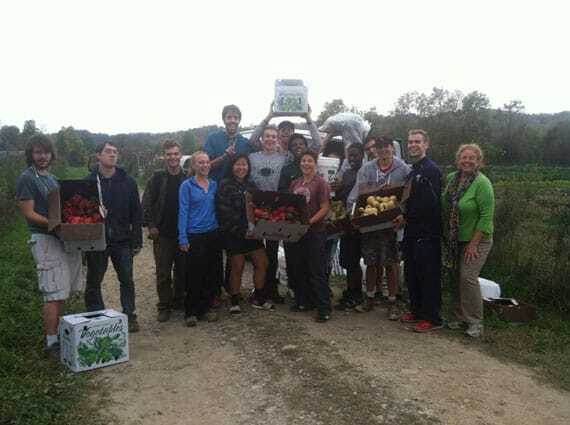 Gleaning relies on volunteers to harvest the crops and frequently other opportunities such as delivering and processing gleaned produce. Last year, volunteers contributed more than 2,600 hours and gleaned more than 120,000 pounds of produce for the Vermont Gleaning Collective. RAFFL hopes to make an even greater impact for the 2015 season. In 2014 RAFFL’s Glean Team gleaned over 25,000 pounds of produce that was made accessible at 20 different distribution or meal sites in Rutland County. This was only possible through collaboration with 22 farms and the assistance of 187 volunteers. Vermont fruit and vegetable farmers produce hundreds of tons of edible, farm-fresh food, but often, not all of their production is sold. Market fluctuations, as well as production realities like hail damage or timing, can force farmers to make a choice between harvesting one crop or moving on to the next part of their season. A modest estimate is that Vermont loses at least two million pounds of high quality fruits and vegetables annually. Gleaning helps capture and share this surplus. For more information visit vermontgleaningcollective.org or call or email Jenn Simons at 802-558-5789 or gleaning@rutlandfarmandfood.org.